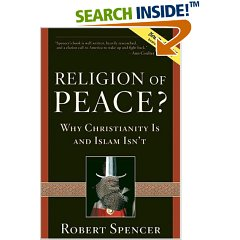 ANSWERS Book Reviews » Blog Archive » "Religion of Peace? : Why Christianity Is and Islam Isn’t"
The main stream Western press has bent over backwards to present Islam in the best ‘politically correct’ light possible as the: ‘Religion of Peace’. Even President Bush refers to Islam with this label. In recent books, documentaries, and movies, the media and the left continue to present serious Christians in an unfavorable light while the threat to Western civilization coming from radical Islam is discounted. Even in the midst of overwhelming evidence that a large portion of Islam is at least sympathetic to Islamic terrorists, many in the Western world look upon Christianity as being at least as dangerous to World peace as the Jihadists. Even more incredible, the thousands of Islamic terrorists and their sympathizers, which run into the hundreds of millions including thousands of clerics, are presented as not really representing ‘true’ Islam; while a few individuals acting on their own, like Timothy McVeigh and one or two abortion clinic bombers, are said to represent Christianity, even though they never claimed to be and have no support in the Christian community for their actions. Robert Spencer has written a book which documents the threat that normative Islam poses for the world. He also debunks the myth of equivalence between Islam and Christianity. He presents evidence from the teachings and leaders of both religions which demonstrates that the real ‘Religion of Peace’ is Christianity rather than Islam. « "Kingdom Come: The Final Victory"